Celebrating the Fourth Jasper Johns Style | Who Are You Calling Crafty? I love Jasper Johns (I have even touched a Jasper Johns – it was in a private collection). 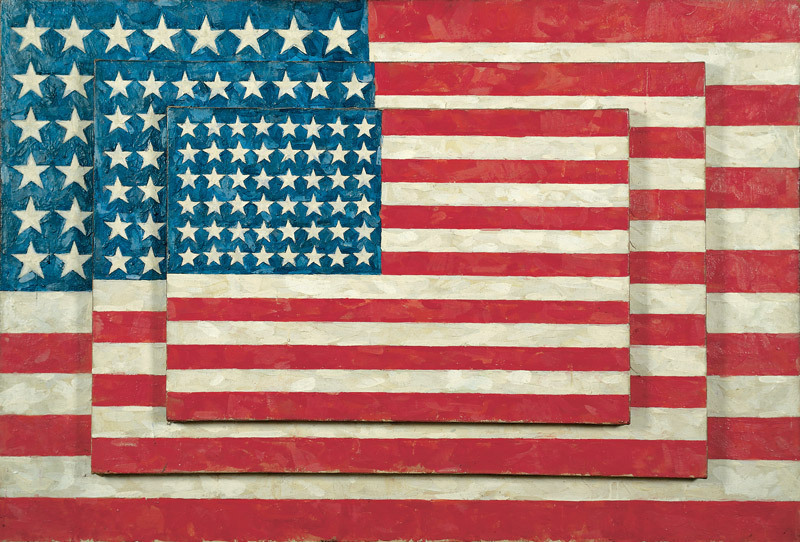 “Three Flags” (1958) by Jasper Johns; Encaustic on canvas (30 7/8 x 45 x 5 in); Whitney Museum of American Art, New York. Art © Jasper Johns/ Licensed by VAGA, New York, NY. The one thing I always wanted to learn how to do well (I have tried encaustic painting but with no success) is encaustic painting. I really wanted to do a kids project revolving around Jasper Johns but I could figure out how in the world could I do a kids an encaustic project. I think encaustic and I think hot wax that can catch on fire easily – not a kid friendly project. I decided to Google Encaustic art projects for kids – I received 411,000 hits. The fourth one caught my eye Craft Knife: Crayola Crayon Encaustic Art. The project is amazing but my kids are WAY TOO YOUNG for an open flame. I decided I needed to experiment myself. I got the box of broken crayons and started to color. I was thinking the whole time what could I use to melt the wax? Then it dawn on me my heat gun. The first idea I had was to do crayon shavings it did NOT work. My heat gun blew the shavings everywhere – I was not amused by this. I was extremely frustrated and decided to color. My paper was still warm melting my crayon – EUREKA!!!! I then decided to hold the heat gun and draw and it worked perfectly! The big challenge was to see if I could get my daughter to draw without “burning” her fingers. She thought it was great and was so excited it worked. The next challenge was to have the Booga do it. showed the Booga that he needed to press really hard I then heated the paper, melting the crayon on the paper. When the paper was still warm he drew on it. I was surprised with how well this worked with both kids especially the Booga. 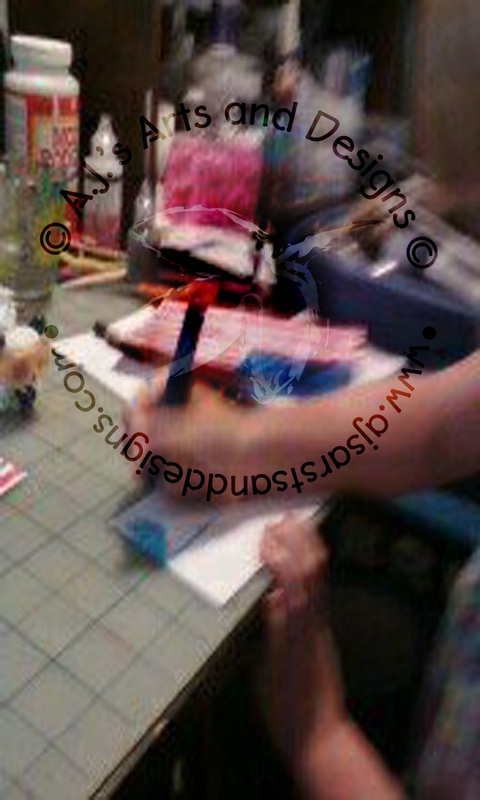 Trying to take pictures while my daughter was drawing with the crayon on warm paper. What can kids learn doing this project (besides the obvious melted crayons of any kind is really cool)? The resolution signed on June 14th, 1777 gave no instruction as to how many points the stars should have, nor did it mention how those stars should be arranged on the blue union. Because of this, stars were arranged in various ways on the blue background. One of the popular designs during this time was the Betsy Ross flag. In 1818, after five more states had gained admittance, Congress passed legislation fixing the number of stripes at 13 – for the original 13 colonies – and requiring that the number of stars equal the number of states. The last new star, bringing the total to 50, was added on July 4, 1960, after Hawaii became a state. Moved to New York in 1949. Stationed in Japan 1952-1953 during the Korean War. Recounting this period in his life, he says, “In the place where I was a child, there were no artists and there was no art, so I really didn’t know what that meant. I think I thought it meant that I would be in a situation different than the one that I was in.” He began drawing when he was three and has continued doing art ever since. His work is described as Neo-Dadists opposed to Pop-Art. Neo-Dadists: a label applied primarily to audio and visual art that has similarities in method or intent to earlier Dada artwork. It is the foundation of Fluxus, Pop Art and Nouveau réalisme. Neo-Dada is exemplified by its use of modern materials, popular imagery, and absurdist contrast. It also patently denies traditional concepts of aesthetics. February 15, 2011 he receive the Presidential Medal of Freedom from Barack Obama. The last painter or sculptor was Alexander Calder in 1977.